There’s a neon sign at the Round House which is intimately known as the Whiskey Light and there’s a song written by Ray Fogg which signifies its meaning. Traditionally, on opening day at the RHB, when that light is illuminated, it means the bar is open; the whiskey is flowing. Ray Fogg graced the small audience at this year’s 125th anniversary opening. He also plans on playing at the traditional champagne closing party when the Whiskey Light goes off in the Fall after Halloween. Although on stage Ray’s cutting wit keeps his audience in stitches, he is a sentimental sort outside the “performer” persona. A man of tradition, Ray themes some of his compositions thereupon. In fact, the title of Rays’ new CD “Waves” which is due out in June, follows an island tradition about a ship. It’s said that between 1911 and 1953 a passenger vessel named the steamer Put-in-Bay cruised from Put-in-Bay to Detroit escorting tourists on day excursions through Labor Day. According to Fogg, islanders gathered at what is now the Jet Express dock, to wave good-bye to the ship on its last journey of the season. The tradition in some form or another has been upheld by islanders through out the years. It is presently practiced at the Lime Kiln Dock at the end of Labor Day weekend. Islanders, seasonal employees, summer residents and curiosity seekers enjoyed what appeared to be an impromptu performance by favorite island entertainers including, Fogg, Pat Dailey, Mike Mad Dog Adams, and Bob Gatewood of Calabash. The title song of Foggs’ new CD “Waves” is about the tradition. In one other sentimental island song, “I Left Catawba” Ray sings about travelling from port to port (in his 27′ Tiara) searching for something better and never being satisfied. The poetic composition ends when Fogg sings that he follows the laughter towards Put-in-Bay…where he stays. The CD contains all original songs pertaining to the islands and Put-in-Bay. It is produced by Kevin Raleigh who was a recording artist and writer credited with several hits of the Michael Stanley Band, as well as a solo artist with Atlantic Records. It will be available at Put-in-Bay gift shops soon. Why does Fogg know so much about Island tradition? He’s been coming here since he was a child, commuting from Rattlesnake Island, where his father has a home. Fogg states that even though he has a home at Rattlesnake, he always wanted to be here, and his songs reflect that sentiment. Ray is a self taught musician who partially credits his father for his quick wit and humor. Fogg began his career at the age of twelve, performing in a band called Bubble Gum II. At the age of 13 Fogg auditioned for his first paid performance at the Regal Beagle in Broadview Heights. After strumming the proprietors favorite song (unbeknownst to Ray) he landed what turned out to be a two year stint at the bar earning $40.00 per night. His mother had to drop him off for work! At that time, in the mid-70’s Fogg entertained audiences with contemporaries such as Harry Chapin, Neil Young and folk rock. After the Regal Beagle, Ray secured an agent and played the college circuit doing several shows a week which were stylized by the techno era. With a driver, sound man and a 35′ tour bus, Fogg wowed college concert halls with a one man show, backed up with equipment which created the facade of a full band and accompaniments. Colleges surrounding the Great Lakes, to as far as Kansas, Colorado, Wisconsin and South Dakota were audience to his showmanship. Three hours of preparation and set up prior to each show, became tiresome to Fogg so he gave up the college circuit, picked up his acoustic guitar and went to work in Cleveland area establishments. Subsequent to that, some time in the late 80’s a group cancelled their performance at the Round House, leaving a date open. Calabash was first contacted, however they were booked. Fogg and Gatewood (of Calabash) had known each other through a mutual agent, hence Fogg was contacted by Gatewood and asked if he would be interested in playing the vacancy. Thus began Fogg’s professional connection at Put-in-Bay. This is his fourth year anniversary at the RHB. After growing up in the area, Fogg became familiar with many of the islanders and he feels fortunate to be able to play at several of the establishments. Subsequent to the RHB Fogg played at the Boardwalk, The Boathouse, Crew’s Nest and Brewery. He describes the people here as Norman Rockwell typed. Here he can enjoy the Rockwells, tourists, and party. He can do a lot of the same music and not be on tour because the audiences are the ones on tour. Fogg says that his music grows into a Put-in-Bay habit, which supports his Put-in-Bay habit, where he is happiest. If you’re up for some great laughs and personalized entertainment you can find the “Island Rock God” At the Boathouse, Brewery, Mossbacks, RHB and the Boardwalk this summer. 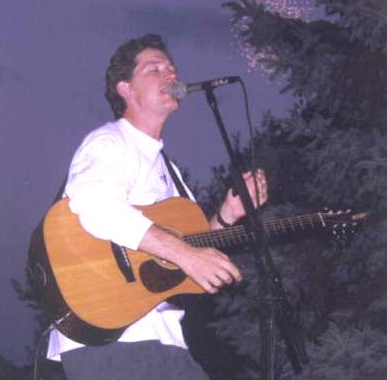 You can help the “Island Rock God” celebrate the release of his new CD at the Round House bar on Sunday June 21, 1998 at about 9:00 p.m. Ray will perform with the five piece band with which he recorded his CD. It will be the first time that Ray has performed with the band at Put-in-Bay. Opening the show will be Bob Gatewood of Calabash, who will perform a solo acoustic set featuring many of the songs on his CD which was released last year.